The Allard Motor Company was founded in 1946 by Sydney Herbert Allard, grandfather to the current proprietor but the story started much earlier..
From the 18th century ancestral home of Warminster in Wiltshire, Sydney's father and other members of his family moved to South London circa 1900, Sydney was born in Streatham in 1910. Sydney's father Arthur Allard was a property developer and master builder, a profession he hoped Sydney and his brothers would follow, but a passion for mechanical devices grew in Sydney from the youngest age rather than for bricks and mortar, Arthur soon released his son from his wish to enter the building trade realising the futility of his efforts. Sydney started with a Grand Prix Morgan three wheeler handed down from his eldest brother Jack, in 1929 Sydney with brother Dennis he competed at Brooklands in a better Aero model financed by their father, they won the three lap handicap event, competition would be Sydney's passion for the rest of his life. In 1930 after a mechanical apprenticeship Sydney was set up in business in Acre Lane, Brixton, London by his father, partnered by a trusted businessman Alf Brisco, Arthur had recently bought a roofing company called Robert Adlard, struck by the name he called Sydneys new firm Adlards Motors Ltd which would lead to years of confusion. 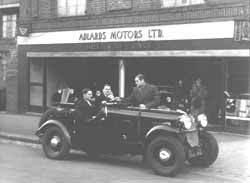 Whilst developing his trade Sydney's Adlard Motors facilities were transformed in 1935/36 with the redevelopment of the site by his father with garage facilities beneath a large block of flats. 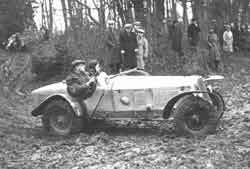 After converting his Morgan to four wheels Sydney lost interest and successive cars followed, Talbot 105, 1932 Ford Model B with 24hp Ford Truck engine and then a Ford TT race car bodied by Jensen was campained in 1935/36 with some success in motor trials. The real Allard history starts with the first true Allard built in 1936 on a Ford Model 48 chassis recovered from a local garage and combined with the complete tail and scuttle from a GP Bugatti Type 51 in a local coachbuilders, additional items such as Bugatti steering assembly, a 3622cc Ford Sidevalve V8 engine and narrowed rear axle were juxtapositioned in such a way to make a perfectly conceived trials car constructed in just 18 days and nights. Named after its registration plate 'CLK 5' proved itself over the next two years with a large number of wins in trials and other races. 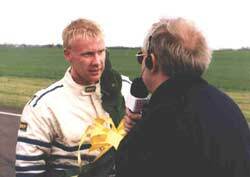 SHA's first win was at Southport Sands 50 mile event on April 26th 1936 with speeds exceeding 100mph. Numerous victories followed in trials events, this was recognised by the motoring press, 'The Motor' featured a cartoon of CLK 5 with the caption 'SH.Allard climbing almost any hill in almost any trial'. By 1937 CLK 5 was a very well known car to fellow competitors and spectators, enquiries came in to Adlard Motors Ltd regarding the possible construction of replicas. Sydney's father still having a major influence in his sons business observed competition activities as non-profit and distracting from Adlards normal garage work. However, this is where Sydney went from being one of the many one-off special builders to a car manufacturer (the others were Lotus and Healey), one definate order led to another and by September 1939 11 cars were built with the 12th being completed in 1946. 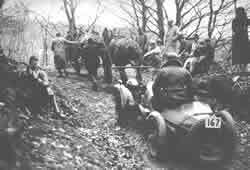 After a short period with a solid front axle CLK 5 and all Allards to follow would have the Leslie Ballamy divided front axles which would give the famous splayed front wheel appearance terrifying so many spectators in the years to come. 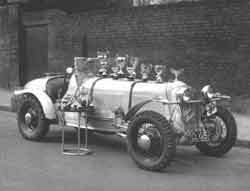 A pre-war team of 3 Allards formed the 'Tailwaggers' with SHA in his new ELL 300 car, Guy Warburton in CLK 5 and Ken Hutchison in the Lincoln-Zephur V12 ELX 50, winning many team prizes as well as individual success. The war years 1939-45 saw Adlards spreading into Fulham to provide overhauls to jeeps, trucks and staff cars returning battered from the front line, he would soon be specialising in only Ford vehicles, there were no racing activities of any kind so Sydney learnt what he could in the war and developed skills within the business that would set him on an firm footing at the end of hostilities. As the war ended he bought all the remaining stocks of Ford components including many sidevalve engines and Ford became the manufacturer that Sydney chose to supply all the major components to his cars through his Ford dealership Adlard Motors Ltd.
1946 saw the formation of the Allard Motor Company who would eventually construct over 1900 cars all evolving from 12 pre-war specials. Sydney had assembled an array of friends and collegues that would form the backbone of the new company and provide valuable advertising in the form of competition successes. 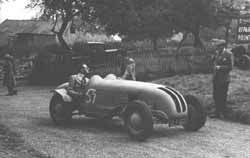 Perhaps it should be noted that it is well known that SHA's prime interest was competition before car manufacture, he maintained a small workshop just for his special projects such as his first post-war special HLF 601, then JGP 473 a forerunner to the J2 model and his most famous special, the Steyr, a single single seater hillclimb car with 3.7 litre Austrian Steyr engine brilliantly engineered to give 140hp through twinned rear tyres, Sydney took the 1949 British Hillclimb Championship in this car combining his considerable engineering and driving skills. The first production cars were the K (later called K1), a two seater sports model, L, a four seater tourer and the J (later called J1) although not actively advertised it was the competition two seater very similar to the K. The four seater M was to follow shortly. Perhaps the most famous Allard many people know would be the 1950 J2 competition two seater, in this car Sydney would be 3rd in the 1950 Le Mans, worldwide recognition and success followed particularily in the USA where the use of Cadillac and Chrysler engines created a Ferrari and Jaguar beating machine. Competition success secured the following few years of business for Allard in the biggest market of the world, the United States, in these years cars exported meant a return in steel from the British government to make more cars, the export market was vital. The J2 was updated in 1952 with the J2X and SHA used a fully enveloped version in the 1952 Le Mans, the JR followed in 1953 but competition was getting stronger by then with Ferrari and their new V12 and new Jaguar models, perhaps the divided front axle was being outclassed but Sydney clung to this original ideal. 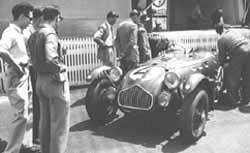 Other models out of the Allard stable included the P1 saloon of 1950, K2 two seater sports of 1952, K3 two seater sports of 1953, P2 saloon 1952, Palm Beach two seater 1953, Palm Beach MkII GT 1956, M2X four seater tourer 1952 and the P2 Safari estate 1952. 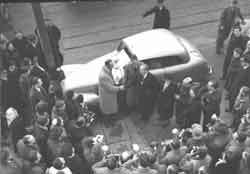 Probably the greatest achievement for Sydney was his victory in the 1952 Monte Carlo Rally in a very tough ice ridden year, the first British win for 21 years since Donald Healey and the only man to win in a car of his own name, the very young Stirling Moss in his first rally was second. This should have been a great advertising opportunity but on February 6th five days after the finish the King died and understandably all press attentions and that of the nation changed in an instant. Beyond 1952 the motor industry for small fish was getting harder, still relying on exports, the US market was maintaining the company, other British makes such as Jowett were already winding up. The market for big muscle cars was diminishing and new models such as the smaller Palm Beach and the disasterous three-wheeled Clipper did little to help, by 1957 cars were only constructed to order with the Palm Beach MKII GT the only model, the writing was on the wall. Adlard Motors were still the mainstream Ford dealership being one of the biggest in London, Allard Motor Company were into performance equipment after winding up car manufacture in 1959. 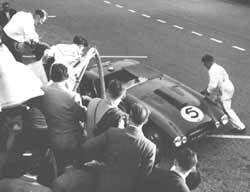 Sydney's son Alan was following in the trade having competed in his first Monte Carlo Rally in 1962 beating Sydney. 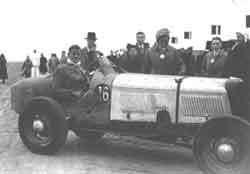 He trained in motor engineering and had accompanied Sydney on many pre-rally reccies before he was old enough to drive. Allard Motor Company produced recognised Ford Anglia competition cars known as 'Allardettes' which were homologated Anglias with 997, 1200 and 1340cc supercharged engines, Sydney and Alan used these cars in several Monte Carlo, Spa-Sofia-Liege rallies, domestic rallies and sprints. Superchargers, rally and race equipment were Allards mainstay, Sydney maintained his competition interests throughout his life having competed in 14 Monte Carlo rallies between 1949 and 1965. In 1960 he brought Drag racing into Britain with the construction of the first British dragster, this was followed in 1964 by the blown 1500cc four cylinder Ford engined 'Dragon', the second large Allard dragster was constructed by his son in late 1966. 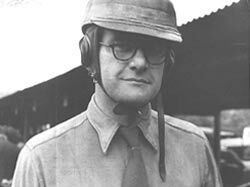 After organising his second drag festival in 1965 which was washed out due to rain Sydney fell ill and was never to recover, he died in April 1966, a legendary figure in British motorsport and the motor industry had gone. Alan eventually took over the Allard business alongside Adlards continuing in rally and dragster competition, Alan drove all three Allard dragsters in competition and in 1968 he took the world quarter mile record in the later Allard-Chrysler machine. In the years to come Alan became the foremost knowledge in Britain on super-charging and later turbocharging as Allards bought both the Wade and Shorrock super-charging businesses, he continued rallying until 1973 with the birth of his second son Lloyd. In 1976 Adlards was sold and Alan moved to Wales to continue the Allard business in a smaller capacity, from 1970 he sold the merits of turbocharging, some ten years later the motor industry would start to produce production turbo cars.1982 saw Alan publish his knowledge in a book titled 'Turbocharging and Supercharging', re-issued in 1986 in paperback form it has since been accepted as the leading technical handbook to the keen enthusiast. Alan continues with turbocharging and intercooling to this day in Monmouth, South Wales. He remains the President of the Allard Owners Club since his fathers death in 1966 and attends events regularly. His son Lloyd started an apprenticeship with him in 1994 with a particular interest in aluminium welding and fabrication, this was further developed under a collegue who was producing intercoolers for the Subaru World Rally Team, Lloyd has been taught to produce a World Class finish to his products. 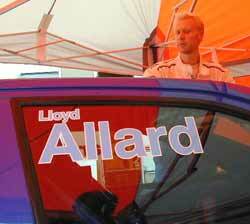 With motorsport in his veins Lloyd along with a team partner constructed and entered a VW Scirocco in a local saloon car championship in 2000, it won the 'Best presented car' on its first appearance. The first season was a learning experience with several disapointments and teething problems, 2001 saw Lloyd top the championship with consecutive class wins, his products having been tested on the proving ground. Lloyd aims to return some of the glory back to the Allard Motor Company with the best quality products possible on the firm backbone of a motoring heritage unrivalled by any other. The news module was installed.